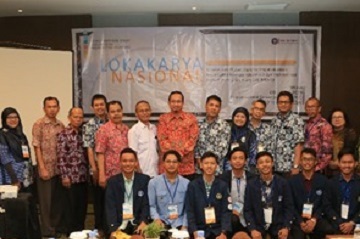 Accounting Study Program of Vocational School, IPB University (SV IPB) held a workshop titled “Diploma IV Curriculum to Prepare Against Industrial Revolution 4.0 and Implementation of Multi-Entry Multi-Exit (MEME) Concept,” Tuesday (9/4) in IPB International Convention Center (IICC), Bogor. The workshop which was organized by Mela Nurdialy, S.E, M.Ak and her team, was opened by the Vice Dean of Academic and Student Affairs of IPB Vocational School, Dr. Ir. Bagus Purwanto, M.Agr. “With this workshop, we hope that lecturers can build the curriculum for accounting Diploma IV program according to the development spearheaded by Industrial Revolution 4.0,” said Dr. Bagus. The workshop invites several speakers, such as: Yuniaryo Hadiwibowo, Panca Kurniawan, Nur Mokhlas Iryo Sukaimi, Edi Jaenudin, Hendra Etri Gunawan, and Puspita Tantri. They elaborated about the materials included in the new curriculum in anticipating Industrial Revolution 4.0 and implementation of Multi-Entry Multi-Exit (MEME) Concept in front of the lecturers, alumni, and Accounting students of SV IPB. Yuniaryo explained about the steps necessary to build Diploma IV curriculum and the comparison between the curriculum and State Finance Polytechnic-School of State Accounting (PKN STAN)’s curriculum. Nur Mokhlas stated that in building a curriculum, a certain uniqueness has to be considered to differentiate it with other institutions’. Other speakers hope that graduates of Accounting Program of SV IPB are not only competent in hard skills but also in soft skill, including their problem solving capability in their job, growth mindset, and adaptation in new environments. This event was a discussion forum, particularly in building the curriculum. The discussion went smoothly. A strong ambition and spirit to produce high quality curriculum were apparent, which will be beneficial to improve education in Indonesia, particularly in Accounting. Resource Person : Dr.Ir Bagus Purwanto, M.Agr. Keyword : Diploma IV, Vocational School, accounting.